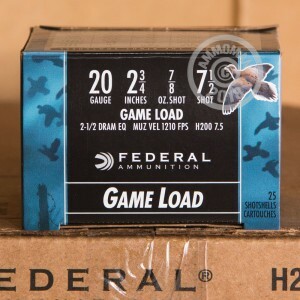 Grab a few boxes of Federal Game Shok 20 gauge ammo for your next range or bird hunting trip. 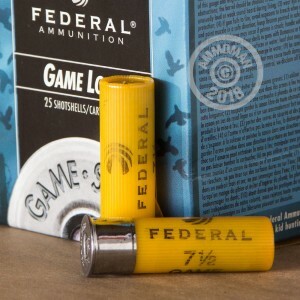 These inexpensive but dependable shells fire 7/8 oz. of #7.5 birdshot at a muzzle velocity of 1,210 feet per second. The low recoil of these shells is especially handy in a lightweight 20 gauge. These shells fire birdshot and are intended for sporting use. 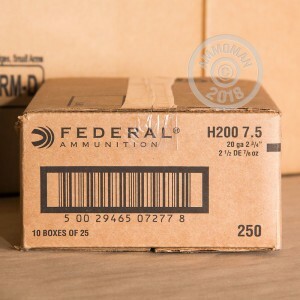 Check out AmmoMan.com's inventory of buckshot if you're concerned about dangerous animals or self-defense! Even better, grab everything you need in one order over $99 and qualify for free shipping.